Mutations in fused in sarcoma, a.k.a. FUS, trigger frontotemporal dementia and amyotrophic lateral sclerosis. A paper in the September 26 Cell Reports offers a possible explanation. 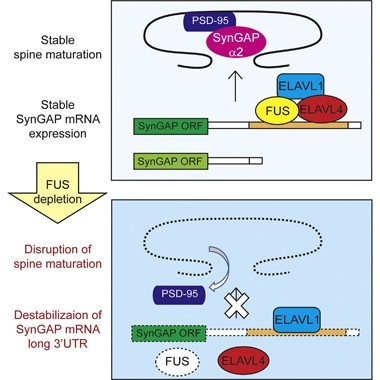 Researchers led by Tsuyoshi Udagawa, Shinsuke Ishigaki, and Gen Sobue at Nagoya University in Japan reported that FUS cooperates with other proteins to stabilize mRNA encoding SynGAPα2, a protein that fosters the maturation of dendritic spines. In animals lacking FUS in neurons, SynGAPα2 levels fell, spines stayed immature, synaptic function waned, and behavioral problems emerged. Restoring SynGAPα2 expression partially ameliorated these deficits. “This fascinating piece of work starts to unravel neuron-specific functions of FUS and demonstrates the complexity of regulating mRNA stability,” said Caroline Vance of King’s College London. In neurons from people with ALS/FTD, the RNA-binding protein FUS gets rerouted from the nucleus to the cytoplasm, where it accumulates in RNA granules (Jul 2010 news and Oct 2015 news; May 2010 news). 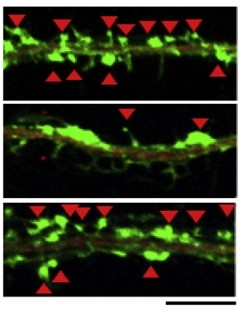 How misplaced FUS hastens neurodegeneration is unclear, but some studies have reported that loss of FUS dampens synaptic transmission and stunts the maturation of dendritic spines (Fujii et al., 2005; Sephton and Yu, 2015). In the current study, first author Satoshi Yokoi and colleagues looked deeper into FUS’s role in synaptic function. In agreement with previous studies, they found that knocking down FUS in primary hippocampal neurons reduced both the total number of dendritic spines and the proportion of mature, mushroom-shaped ones. PSD-95, a major post-synaptic structural element, was excluded from spines, though expressed at normal levels. Yokoi reasoned that loss of FUS could affect the expression of proteins that usher PSD-95 to the synapse. Indeed, a screen for missing PSD-95 partners in FUS-deficient neurons homed in on SynGAP. Tenfold less of the protein bound PSD-95 in FUS-deficient neurons, and SynGAP expression halved. Specifically, FUS deficiency only dampened expression of SynGAPα2. This SynGAP isoform, which lacks exon 19, has been reported to increase synaptic transmission, while SynGAPα1, containing exon 19, decreases it (McMahon et al., 2012). 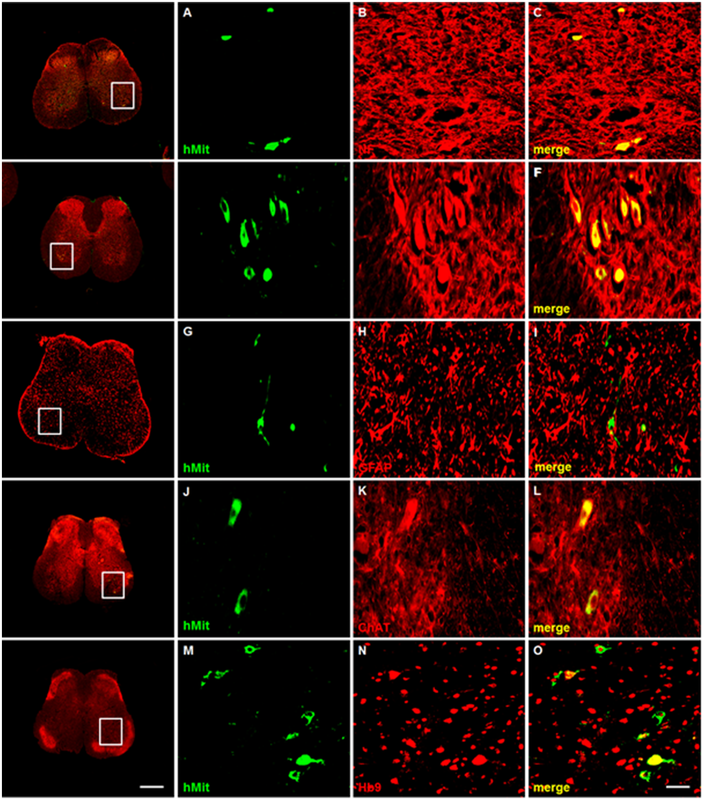 Strikingly, overexpression of SynGAPα2 (but not SynGAPα1) in FUS-deficient neurons rescued the spine abnormalities. How did FUS support expression of SynGAPα2, but not SynGAPα1? Using genetic and biochemical approaches, the researchers pinned the differential down to the 3’UTR. They found that SynGAP 3’UTRs come in two varieties, long and short. Only the long UTR contained a binding site for FUS. While both short and long 3’UTRs were detected for each SynGAP isoform, SynGAPα2 had a higher proportion of long 3’UTRs than did SynGAPα1, making it more sensitive to FUS’s function. With the help of another RNA-binding protein called ELAVL4, FUS preferentially bound SynGAPα2 mRNA and protected it from decay (see model above). Conversely, in FUS-depleted cells, another ELAVL protein, ELAVL1, bound to SynGAPα2 mRNA to promote its destruction. Overall, the findings suggested that loss of FUS destabilized SynGAPα2 mRNA, cast PSD-95 adrift, and stymied the maturation of dendritic spines. How might this relationship play out in vivo? To find out, the researchers conditionally knocked out FUS expression in the mouse forebrain. This slashed both SynGAPα2 levels in the hippocampus and mature dendritic spines on hippocampal neurons. The animals also were hyperactive and less anxious than control mice, though they performed fine on memory tests. Injecting viruses expressing SynGAPα2 into the animals’ brains restored the maturation of dendritic spines, and largely ameliorated the behavioral problems. The researchers contend that loss of SynGAPα2 mRNA could play an important role in synaptic dysfunction in FTD and ALS. In line with their previous findings that FUS protects mRNA for the AMPA receptor subunit, GluA1, albeit by stabilizing its polyA tail, they proposed that mRNA protection represents a broad, pathologically relevant role for FUS (Udagawa et al., 2015). Both gain-of-toxic-function and loss-of-function mechanisms have been proposed to explain FUS’s role in neurodegeneration. Yokoi, Ishigaki, and Sobue wrote to Alzforum that their findings favor the latter. They speculated that FUS aggregation in the cytoplasm might thwart the protein’s protective prowess. Though mRNAs are ultimately transported into the cytoplasm for translation, many of the RNA processing events regulated by FUS occur in the nucleus, including splicing and polyadenylation—and ELAVL1 binds to mRNAs there as well. Yokoi S, Udagawa T, Fujioka Y, Honda D, Okado H, Watanabe H, Katsuno M, Ishigaki S, Sobue G. 3’UTR Length-Dependent Control of SynGAP Isoform α2 mRNA by FUS and ELAV-like Proteins Promotes Dendritic Spine Maturation and Cognitive Function. Cell Rep. 2017 Sep 26;20(13):3071-3084. PubMed. Fujii R, Okabe S, Urushido T, Inoue K, Yoshimura A, Tachibana T, Nishikawa T, Hicks GG, Takumi T. The RNA binding protein TLS is translocated to dendritic spines by mGluR5 activation and regulates spine morphology. Curr Biol. 2005 Mar 29;15(6):587-93. PubMed. Sephton CF, Yu G. The function of RNA-binding proteins at the synapse: implications for neurodegeneration. Cell Mol Life Sci. 2015 Oct;72(19):3621-35. Epub 2015 Jun 6 PubMed. McMahon AC, Barnett MW, O’Leary TS, Stoney PN, Collins MO, Papadia S, Choudhary JS, Komiyama NH, Grant SG, Hardingham GE, Wyllie DJ, Kind PC. SynGAP isoforms exert opposing effects on synaptic strength. Nat Commun. 2012 Jun 12;3:900. PubMed. Udagawa T, Fujioka Y, Tanaka M, Honda D, Yokoi S, Riku Y, Ibi D, Nagai T, Yamada K, Watanabe H, Katsuno M, Inada T, Ohno K, Sokabe M, Okado H, Ishigaki S, Sobue G. FUS regulates AMPA receptor function and FTLD/ALS-associated behaviour via GluA1 mRNA stabilization. Nat Commun. 2015 May 13;6:7098. PubMed.